Thus I am setting two support lines for two scenarios. Support line 2 at 1600 for knee-jerk reaction of a Pakatan win but with a more sustainable long term rally due to an expected better governance and less backdoor deals. 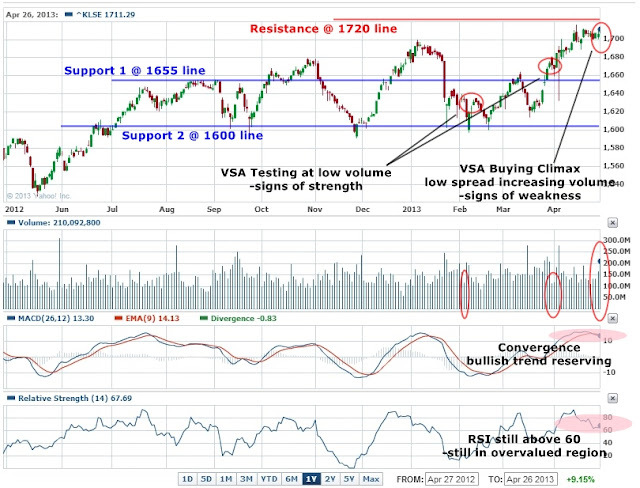 Support line 1 at 1655 if BN retains their dominance and smaller rally because there is nothing NEW to be expected. Second my portfolio grew by another RM5000. This helped push my TWRR from 8.52% to 9.81%. As usual AMP Capital has good piece of information (freely available, no sign ups) on weekly global market & global economic update. It is usually updated every Sunday night so go read it when you have the time. #1 No change to Aboi's rating thus far. #2 Bought 3200 units of Supermx shares at RM1.89 each as reflected on the table above. #5 Portfolio target for third year @ RM128k for April 2013 and fourth year @ RM140k for April 2014. Third year target EXCEEDED! TNB: As PR has plans to cut electricity tariffs. Stocks linked to our PM Najib: CIMB, PNB and Khazanah linked shares. Astro, DRB-Hicom, Maxis, MMC, Padiberas, Tradewinds, Gamuda, IJM, YTL and its related shares, Berjaya group of stocks and shares, FGV (Felda), Plus Expressways and all other listed highway related concessionaires. Construction related stocks will likely decline if Pakatan wins. Consumer related stocks, REITs and some neutral banking stocks. I am also likely to hunt for good deals post GE13; Digi and a new bond fund. As you can see my portfolio consists of safe stocks/funds so there are no changes needed coming GE 13. Salam UBAH! Remember to cast your vote early (8.00 AM) on 5.5.2013!